This Blackberry-seeking mom in Halifax wrote the best Kijiji ad I've seen in ages. This is instantly added to the Hall of Fame. Even the CBC is interested - but you heard it here first at YouSuckatKijiji.com! I've offered her these antique Blackberry units in exchange. Read the ad first, then listen to the first interview with author @CynBragg. And someone, please get her kid a Blackberry and write her the custom apps! I want to buy a BLACKBERRY, a shiny barely scratched in good condition BLACKBERRY. Apparently to my newly turned 13-year-old daughter, it is the only phone that will do. I’ve tried to talk her out of it. I forced her to watch a recent news broadcast where the analysts talked about the troubled times for RIM. She told me about how I just wanted to ruin her life. I showed her reviews and videos of other phones. She gave me a winced up face that looked like she was constipated or like I had finally given the cat away(an ongoing threat when she doesn’t clean the litter box). I even asked her to look at older models of the iPhone. She’s not having any of it. 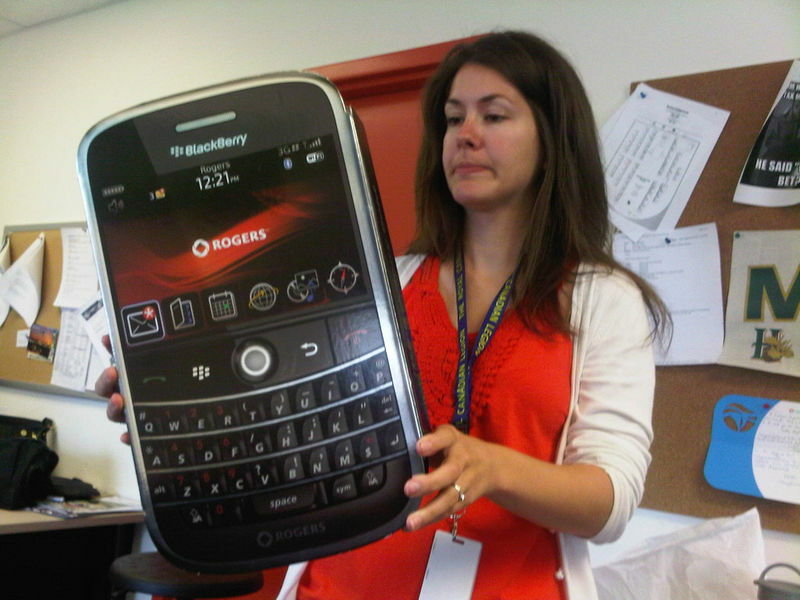 She insisted outright, it must be a BLACKBERRY. Given that it’s her only birthday request we agreed we would compromise and I would get her a secondhand model. Now why exactly does a 13 year old need the phone of a 45-year-old corporate business man who doesn’t see the need for cool apps and secretly checks his emails while sitting on the can? I asked her if she had some conference calls she had to schedule in her calendar. If her government job complete with full pension planned on paying for a data plan. If she was expecting an email at 3 am from a client and would be sleeping with it on her nightstand? What is it about this phone that looks like my old Casio calculator that is so appealing? I thought these days it was all about the touch screen. Apparently it’s all about the BBM. Do the makers of Blackberry even know this? Do they know there is this newly pubescent market clammering to instant message their friends “w’up?” “nmu?” “nm”. Do they know that they are anxiously updating their Facebook status… “Bored please ttc” or writing on each other’s wall “TBH you’re so pretty. Text some time?” Apparently, our kids don’t realize that they are already instantly chatting on a social network, they need to take it offline to their “smart” phones for more stimulating conversation in 140 characters. And apparently, texting isn’t fast enough. Only BBM is instant enough because not enough kids in her school have the iPhone. I’m told that EVERYONE at her school has BBM. It doesn’t matter that when the time comes for an upgrade, many of her friends might move on to iPhones and androids and she’ll be on BBM by herself because no way in hell am I buying her a new phone next year. She says she doesn’t care. She believes in BBM. And, of course because I am a mom, that I’m just lying. Apparently, we just lie to our kids to get them to do what we want. Since we’re all talking about the future of Blackberry these days and I am talking about the untapped potential of the 12 to 15 year old set, I thought I would offer up some marketing mom’s words of advice for RIM. Here are some features and apps that could work for all of us. CHORE LOG APP: Each time a household chore is completed and logged, the phone is permitted to be charged. If no chores are logged the phone dies a slow death just like the rat that snuck into her room and took a bite of the green sandwich it was attracted to underneath her bed. MALL TRACKER APP: Tracks teens whereabouts at any given mall and gives teen a small electric shock when mom has been parked outside the Bay for 15 minutes and is hopping mad. ANTI BULLYING APP: Detects rude and insulting texts and turns them to compliments. Just a few ideas Blackberry, I think if you execute them you’ll sell more models to teens. On second thought…you probably sell more models to moms insisting on buying them for teens. And for the record Blackberry, I wish you all the best luck in the future. You brought us the crackberry. You made us addicted to checking our emails at midnight just in case our micro managers want to double check if we sent that email off to the client at 630 when they emailed us while we were at the Swiss Chalet trying to convince our 10 year olds they were not to big to order the kids meal. You were the first SMART phone. And while sometimes I resent you for keeping us so connected, you gave me one of the last pictures I have of my mother and my daughter together at the a tiny hole in the wall Chinese restaurant. It’s proudly uploaded to my Facebook page and for the many memories we have archived through you, we all have you to thank. Oh, I’m willing to pay between $50 and $100 bucks and I must be able to hook it up to Telus where I can get my prepaid plan that only allows her 250 mb of data per month. (I'm told Curve 9300 or newer) For those who might send me tales of caution, my daughter gets hour long lectures about proper internet conduct that can only be rivaled by Dr. Phil himself. She doesn’t need the above apps but just in case, I'd like to have them. She wants you all to know that she is a kind respectful girl who doesn't do those things and she is. You deserve the world sweetheart! Very well done. Best Kijiji Ad Ever? You tell us, in the comments. She should tell her daughter that there's BBM apps for other phones... lol Blackberry's are whaaack.